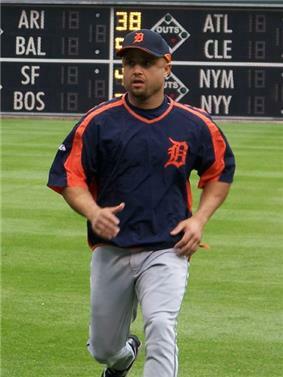 Plácido Enrique Polanco (; born October 10, 1975) is a Dominican-American former professional baseball player. He played in Major League Baseball (MLB) for the St. Louis Cardinals, Philadelphia Phillies, Detroit Tigers and Miami Marlins. He was a second baseman, third baseman and shortstop. 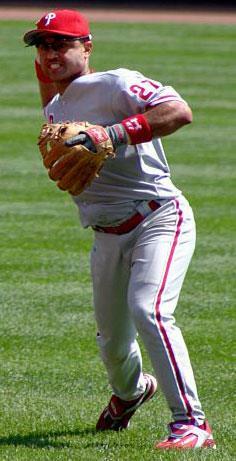 He was twice voted to start in Major League Baseball All-Star Games: in 2007, and again in 2011. On December 20, 2012, the Miami Marlins and Polanco agreed to a one-year contract worth $2.75 million, making him the second-highest paid player on the team. The Marlins did not re-sign Polanco after the 2013 season and he was unable to find a contract in free agency for the 2014 season. As of March 2015, he claimed to be "90 percent" retired but remained open to the possibility of returning to playing or launching a coaching career under the right circumstances. ^ John Lowe (July 10, 2008). "Polanco becomes U.S. citizen before Wednesday night's game". freep.com. Retrieved July 10, 2008. ^ "2007 Detroit Tigers Batting, Pitching, & Fielding Statistics". Baseball-Reference.com. USA Today Sports. Retrieved 22 February 2013. ^ Jordan Bastian / MLB.com (July 20, 2007). "The Official Site of Major League Baseball: News". Mlb.mlb.com. Retrieved October 5, 2011. ^ Beck, Jason (December 3, 2009). "Tigers' Polanco nabs Gold Glove honors". ^ Zolecki, Todd (December 3, 2009). 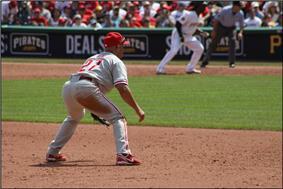 "Polanco happy to be back in Philadelphia". ^ Ladson, Bill (November 2, 2011). "Polanco's Gold Glove puts him in elite company". MLB Advanced Media, L.P. Retrieved 2011-11-05. ^ Parent, John J. "Marlins Sign an Actual Major League Player". Call to the Pen - A Major League Baseball Fan Site - News, Blogs, Opinion and more. Sports Illustrated. Retrieved 24 December 2012. ^ Adams, Steve (March 4, 2015). 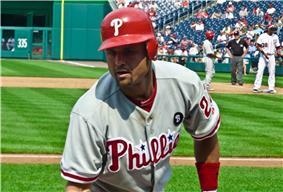 "Placido Polanco “90 Percent” Retired, Open To Coaching". MLB Trade Rumors. Retrieved 8 May 2015.